Former hitman Francois Costello (Johnny Hallyday) is in Macau to avenge the brutal and apparently random murders of his daughter, grandchildren and son-in-law. 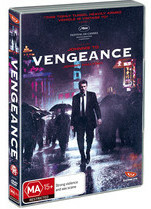 Being a Frenchman in a Chinese colony he sticks out like a sore thumb and his memory is rapidly failing him, so he enlists the aid of three local assassins in tracking down the killers of his daughter and her family. The foursome head off to Hong Kong to follow a lead and, this being a Johnnie To film, much gunfire and moody neo-noir gangsterism soon follows. Prolific Hong Kong-based director To has certainly carved out a niche for himself with his last few features, producing gritty and darkly realistic depictions of the Hong Kong underbelly. He has also become known for his stylised violence and penchant for ‘heroic bloodshed’ plotlines, and Vengeance certainly doesn’t disappoint in this regard. There are a number of well-staged gun battles, including one memorably adrenaline-soaked scene which takes place in parkland under shifting moonlight, and the shady dealings of Hong Kong crime lord Mr Fung add a further layer of narrative complexity to the proceedings. Though it shamelessly borrows from a number of other films, most notably Memento, this latest outing from To was well-received at Cannes and has received a mostly positive critical reception following its limited theatrical run in Hong Kong and France. The film was originally set to star French acting legend Alain Delon, but when he showed little interest producers ending up courting Gallic superstar Hallyday, a decision which seems to have paid off in spades. The grizzled Hallyday has sufficient mystique to pull off such a role, plays well off his trio of talented co-stars and possesses more than enough charisma to remain an interesting and complicated focal point as the film progresses. Though not without its flaws, Vengeance is nonetheless an enjoyable entry into the sizable Johnnie To oeuvre. The 5.1 sound is big and bold throughout and the 2.35:1 anamorphic transfer looks as moody and atmospheric and one could hope. All in all this is a sleek, excitement-laden effort that will appeal to fans of revenge melodramas, Hong Kong neo-noir flicks and good old-fashioned action.